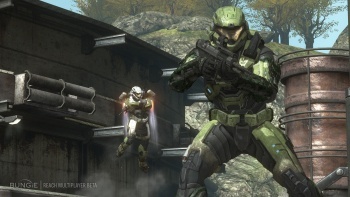 In less than seven days, gamers have accumulated enough play time on Halo: Reach to fill dozens of lifetimes. According to statistics released by Bungie, Halo: Reach has been played for more than two thousand years since its release last week. The exact total stands at 2318 years spread over 31 million play sessions. The majority of the play was in the game's campaign mode, with 1,365 years of play time, with matchmade games following closely behind with 953 years. During that time, more than eight million daily challenges were completed, and more than a 78 million credits were earned. Bungie also said that the number of concurrent users for Reach had exceeded 700,000, beating Halo 3's all time score. These numbers are impressive, but considering the size of the launch - around $200 million on the first day - they're not really a surprise. There was never any doubt that Reach was going to be a big hit, and these numbers just confirm that.